Ann Summers, a photo by PhylB on Flickr. We happened to be shopping one day on holiday in Montevarchi in Italy. It seemed like a fairly down to earth town with reasonable prices. Thomas saw a shop that had T-shirts from €3,99 so went in for a look. Anna wandered in behind him. Neither of us are big shoppers so Anna isn't often dragged into clothes shops. There were mannequins everywhere. Some were standing, others sitting and lying in various positions and states of dress. She looked around them, fascinated. I assumed she was looking at the clothes they were modelling. She certainly didn't seem worried or distressed. Suddenly and quite matter of fact she announced: Ahhh, so that's what they do with dead people? I didn't understand at first, then realized she was touching one of the mannequins! The imagination of a small child is a strange world indeed! As with all siblings, there are times when mine wind each other up. 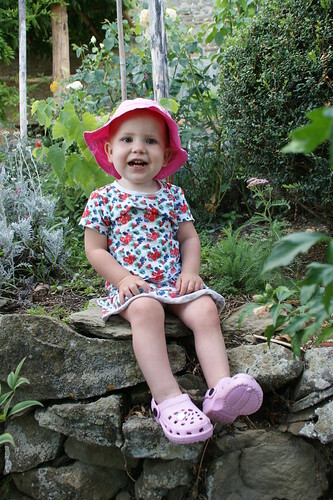 Charlotte seems to take great pleasure out of playing with the little ones at the moment but because of the large age gap (6 years to Léon, 8 to Anna and 10 to Amaia) she sometimes tires of being their play thing and deliberately annoys them. I often hear myself berating her for this. Anna summed it up wonderfully yesterday shortly after Lots had offered her a toy then told her she wasn't getting to have it after all...'Why are you making me so whiny, Charlotte?' she asked! THE END OF THE BELLING SAGA! 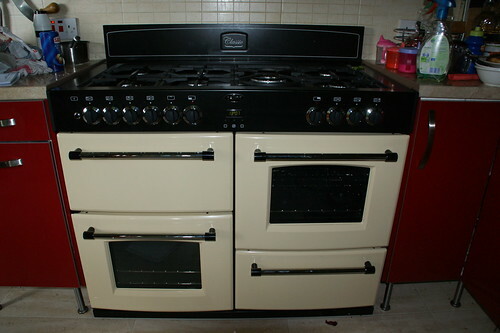 New cooker, a photo by PhylB on Flickr. I know you've all been waiting for the next instalment of my Belling cooker saga. No, they didn't send another wrong fascia, no Jake, Jack and Robert didn't drop by but we have definitely had a result! Jack turned up without a new fascia on the right day - the first time any Belling engineer has turned up on the right day (they are usually up to two weeks early). He looked at the 16 doors we have in the garage, and 3 fascia panels and concluded he really couldn't be bothered with us any more so phoned Belling and told them to authorize replacing our cooker! I was out on the school run and came home to a job number and a phone number for a Sammy Davis (!? was this a joke?) who would arrange it for me. Not only did Sammy turn out not to be a one-eyed, black Jew, he turned out to be a she! But she replaced my three year old cooker, which was out of warranty, with and brand new model because she couldn't find a replacement fascia, when in fact it was the door that had broken all along, and they'd already fixed that! I had to laugh, when an hour after it arrived the company I had bought it from originally phoned and tried to sell me an extended warranty for just £7-50 a month... why on earth would I need that when all it takes is the charm and patience to spend two months on the phone to them to get a new one completely without a warranty!? For years I've been ranting about UK school uniforms. My kids' primary has always advocated the polo shirt and sweat shirt option, and although the shirt, tie and blazer that would have been worn when I was a child is still available, only one or two children in each class tend to wear it. Personally I would go further, introducing that in high school (why on earth do girls wear ties in high school?) And what's wrong with jeans or a skirt with it all, like Anna wears to nursery with her polo and sweat shirt? Scotland is grey enough without forcing them to dress in grey (or black) for 13 years! Occasionally as a small child has passed me in a blazer and tie, I have felt sorry for him or her. I've mentally blamed their parent for wanting to dress the poor wee bugger in such a ridiculous manner. But I hadn't ever considered it could be the child's idea... not until half way through primary one when Léon started his campaign to get me to dress him smartly. He begged and begged for a blazer and tie. 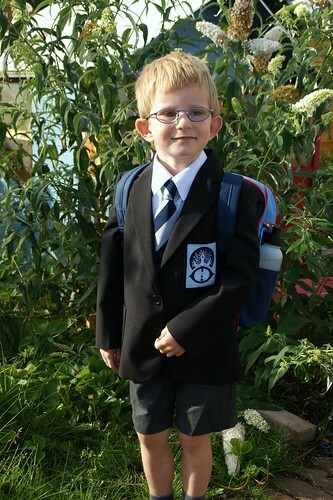 Originally I managed to stall him by telling him the school was designing a new tie for its 50th anniversary so their would be no point in buying the old one, but as that project was delayed until later this year, he would no longer be pacified and insisted starting p2 in the smart uniform. I turned up the first day expecting him to come out with his shirt untucked in a real mess as he's never overly neat and tidy in his usual uniform but he exited as pristine as he had entered, and moreover extremely proud. He is a little boy who never ceases to surprise me! Our Lancia, a photo by PhylB on Flickr. We had to hire a car in Italy - Brita and Peter live in a mountain village that is too remote for public transport. Peter picked up half of us so we only needed a small five seater. We opted online for their bottom of the range Fiat Punto (or similar). Avis in Arezzo don't seem to have a huge number of clients. We arrived to a man sitting on a deckchair on the main square. In front of him were two Lancias. The first was a Lancia Ypsilon, the second a Lancia Delta Sport. The Ypsilon was our Fiat Punto substitute. I could already imagine three weeks of Thomas driving Peter's Fiat Multipla while I listened to the four kids in my car ranting about leg and elbow room. The nice Italian man asked if we wanted his Delta instead at no extra cost given the length of our hire period. I was about to jump at the chance when he mentioned it had the added advantage of being an automatic. I was struck instantly with a mix of fear and horror. Last time I drove an automatic, I was 17 years old and dad had allowed me to try his Ford Cortina automatic on the industrial estate in Thornliebank. It drove a bit like a souped-up dodgem car. It changed gear just before or after a human would but never at the right time. I couldn't imagine being stuck with one of these on a mountain pass for three weeks and was about to decline when Thomas showed up. He mentioned he'd never tried an automatic and begged me to reconsider. The Italian bloke thought I was insane too so I gave in, reluctantly. 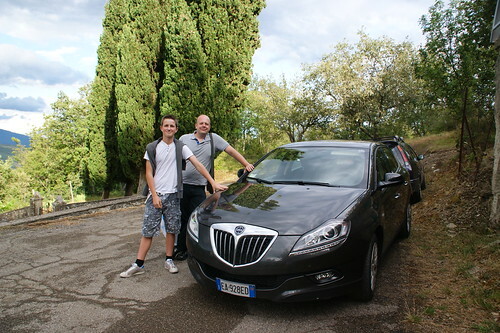 After all, in 26 years automatics had bound to have improved, so I jumped in and started my drive out of Arezzo. It felt unsurprisingly like a bloody dodgem car, albeit a powerful, growly one. When I reached the mountain I started my ascent and noticed the Lancia, like the old Ford changed gears several seconds after I would have manually, jolting me forward or back in my seat. I was already beginning to loathe it with a passion. It grumped at me every time I tried to start it without my foot on the brake. And it didn't have a very obvious biting point which made three point turns on the mountain pass even more fun than usual! As the three weeks went on, I noticed however that it was annoying me less and less and I even learned to appreciate being able to give the road my full attention in the hairpin bends on the single-track chunks as I didn't need to change gear. I'm also wondering why Lancia pulled out of the UK - they make such pretty cars that would easily compete with Alfa Romeos or the likes that sell well here. Any ideas? Pieve Pontenano, a photo by PhylB on Flickr. OMG - what happened to my baby? She suddenly looks about 4! On Monday I was in Rome with Thomas and my two oldest kids. 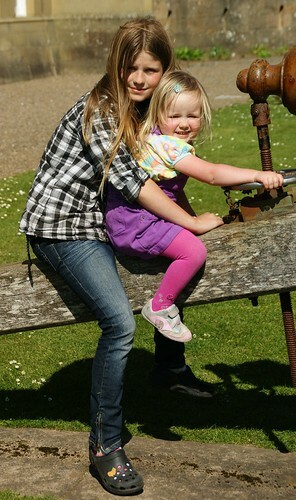 We only had one day to see things so we decided to run quickly round the main sights. At the Vatican, while Charlotte was looking somewhere between appalled and surprised by the number of nuns you could possibly see in one day, we noticed many of the tourists were buying postcards and sending them with special Vatican stamps as it is a separate state. Marcel suggested sending a pc to his French grandmother as she's catholic. He bought a stamp and card. He stood fiddling with the stamp looking perplexed. What's the problem? I asked. I can't get the back off it, he replied. I pointed out that you lick stamps and they stick on the card. He genuinely had no idea! While we were laughing and ridiculing him, Charlotte jumped to his defence with the wonderful phrase: I don't know how to work a stamp either! He then asked which side of the card you wrote the address on! He was 14 last week! It turned out he had never sent a card or letter before in his life. At 14 I had twenty penpals and collected stamps. How things can change in a generation! Remind me not to apply for a job with the Royal Mail if that is the way things are going! 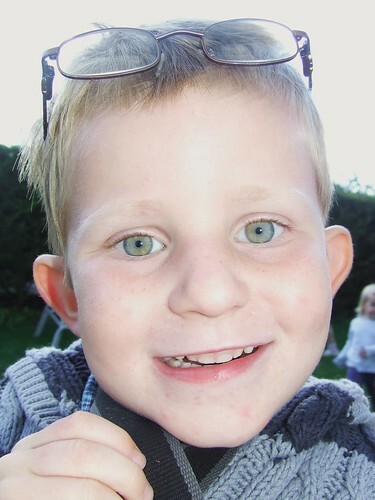 Léon's beautiful eyes, a photo by PhylB on Flickr. Léon can be naively sweet and innocent at times. Two days ago we went shopping in Bibbiena. Because we have hired a five seater car, we have to leave two kids behind every time we go out. We left Anna and Amaia. Léon didn't really want to come either so to bribe him we offered him a fancy ice cream while we were out. Fearing meltdown on return, I told Léon that mentioning the ice cream to Anna might upset her. I don't want any taunting or teasing, I told him. We returned and sweetly he remained silent all afternoon and evening. I asked Anna what she had done with her grandmother while we were out and she told me about playing in Margaret (next door)'s paddling pool. Léon was a little put out - saying he'd have preferred to play in the pool too. What do you fancy doing tomorrow, Pudge? I asked. I think I'd like to play in Margaret's pool, he said, then quizzically added pointing at Anna - she won't get a secret ice cream while I'm over there, will she?